Matt, if you go to freepolls.com or something like that( I actually think the link is underneath the poll), you can create a poll and put it in your blog. I did hear about your trip to Camden yards, and was actually invited by your twin to attend, and too bad for me, I could not make the trip. I am glad you had an awesome time! As a Yankees fan, I am going to say A-rod should take MVP for carrying the Yanks throughout the season, and homered on Saturday to seal the Yankee's divisional championship. He also contributes more defensively than "Big Papi". There is no doubt that David Ortiz is an excellent player and makes big offensive plays when the Red Sox need him to, but I just feel that the MVP is a player who does all things for his team, as A-rod does, not just makes big hits. Jo, that is so awesome that you were that close to #42. He is one of the best closers in the Majors, and is probably a future Hall of Famer. Too bad for that punk kid, right? I will remember to try to check out Camden Yards when I get the chance. How far away is it? Pinstripes, yes I was so happy to know of a Yankees win. Randy Johnson showed why he is one of the best pitchers in baseball, and how badly he wants to win a championship with these Yanks. A-rod came through again (can we all say MVP) I hope the Yanks can keep up with Colon on Tuesday, because he is a quality pitcher! I have faith though, most recently they took 2 out of 3 games against the Angels. Also, lets hope that the White Sox can trample Boston so at least they cannot win another World Series again! Also, thank you to all those who have voted in my interactive poll. 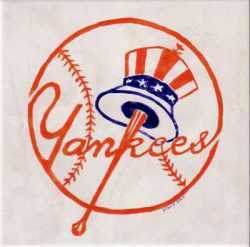 Thus far, the Yankees are the sure favorite to win this year's World Series, with presently 80% of the vote. Nice voting!! i wish the philies made the wild card. Boo to Winning but Loosing! Thanks for letting me know how make a poll. I put one up on my blog so you should defintley check it out and vote. I think that is pretty cool how you can design a custom poll like that. Anyway, last night the Yanks lost to the Angels so the Divisional Series is tied 1-1. Well see if they can take the next two games at home in NY and win the series. I have enjoyed watching Robinson Cano perform well in his rookie season. I know that you had the opportunity to work for the Yanks minor league team (Trenton Thunder) while he was a player there. Do you have any information to share about Cano. I'd like to know more about him.